Hi everyone! Today's post is an indie brand that I hadn't heard of before, Different Dimension. DD takes inspiration from things like movies, books, and causes close to her heart. 50 Shades is inspired by, you guessed it, 50 Shades of Grey! It's a dark grey jelly base with lots of different types of glitter and shards in it. Seriously, there are a lot. For this swatch, I've shown one coat over Sally Hansen Wet Cement. Wet Cement is a pretty light grey so you can see how much the base is tinted. Light It Up Blue is a polish inspired by World Autism Day, the organization Autism Speaks, and its Light It Up Blue initiative. 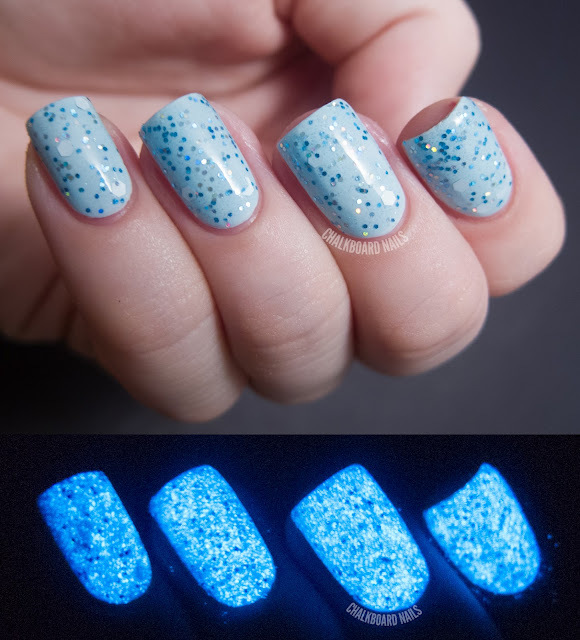 This polish is so appropriate for its inspiration, because it literally lights up blue! How cool is that? I've layered one coat of it over white for this swatch. Of course, layering over white causes the polish to glow better, but this one really doesn't need help glowing -- it has an incredibly strong and quick charging glow. An awesome thing to note about this polish (and her other autism awareness polish, Puzzle Pieces) is that 50% of the profits are donated to the cause. Social Suicide is a black and white glitter AND the name comes from Mean Girls! I'M ALL OVER IT! I've layered one coat of it over China Glaze Wicked Style. It has really good glitter density and applies easily. I love the combination of glitter sizes, and this is a great option for those of you that don't like black and white glitters with bar pieces. 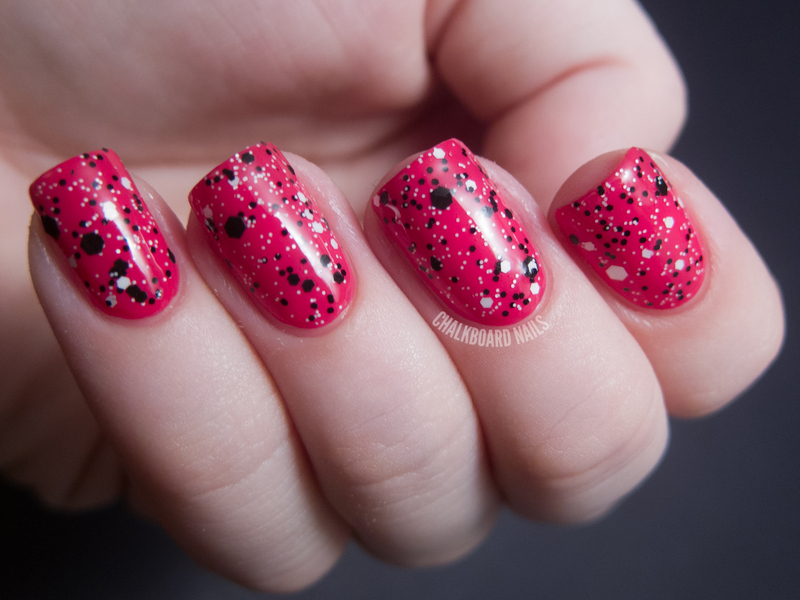 That Is So Fetch is another polish from the Mean Girls collection. I've shown two coats of it here over OPI Rumple's Wiggin. This polish is primarily purples, but it also has some great iridescent glitters in it! I really love this one, it's delicate, like a spray of flowers or something. Different Dimension polishes are available on Etsy, and you can also keep up with the brand on Facebook. Readers of Chalkboard Nails can save 20% on their orders for the next two weeks (until the 31st) by using the code CHALKBOARD20! GET GOIN! I LOVE Light It Up Blue and the cause behind it :) Will definitely be looking into making a purchase soon. Gorgeous polishes! I absolutely love all of them. Social Suicide is my fave! I also like 50 Shades, if I can get over the fact it's named after the book lol (not a fan). It's probaly not possible to get these shipped to Finland.. what do you think? :S I'd love to get them all, they are way too pretty just to be passed by!! I think I'm in love - Social Suicide is just what I need! I love the glow in the dark polish! It looks so fun!!! I just went and snagged 'Social Suicide' from the shop. I've been searching for a good black and white glitter polish (since so many shops that have great ones are closed on etsy right now) and I'm really hoping this one is great! Thanks for the discount code! Just bought 50 shades because of your lovely swatches....ahh! Wow Wow Wow!! Light it blue is more than amazing!! Looks like she is out of Light it Up Blue :( . It is so pretty! Oh these are really pretty and cute! Light it Blue is awesome! I went to buy a ton of these polishes after reading this post - added all to my basket and found out they don't ship internationally :( Heartbroken right now as those polishes are a whole other kind of awesome! Gorgeous swatches, as always Sarah! :) I'd buy Light it up Blue for sure, too bad it's out of stock right now. Please please please search the web for the phrase "Autism Speaks doesn't speak for me" and STOP supporting them. I love your blog and the nail art you do, but every time I see you supporting Autism Speaks my heart dies a little. those look awesome in the dark! Wow... Too many great choices!!!! Love them all but 50 shades is my favorite. Really great one for fall and winter. Awesome polishes! Love Social Suicide! OMG her little polish bottle necklaces are to die for!! And these polishes are awesome!! Where did u buy the autism nail polish, i must have it!!! Was Light It Up Blue photographed in just darkness or under UV light?